Contact us with your request to treat your valves. We will respond with quote, which includes return postage. Typical turn around time is maximum 14 days from receipt, possibly earlier. You ship your valves to us, we will test them on our AVO 5 Type IV and advise you of their condition prior to cryo treatment. We will also let you know if any received valve is suspect or weak. On your acceptance, we will treat your valves, re-test them after treatment and advise you that the treatment is complete. Send payment via Paypal, money order or direct fund transfer. We will ship valves back to you on receipt. 5 to 10 ea. 11 to 20 ea. There was a stunning improvement in every perceivable parameter. What struck me at first was the blackness, lack of grain, hash and noise between the instruments. The voice appeared to be so much more realistic, as a person right there in front of you, coming out of an absolute black background. It was like real music, rather than artificial. At first I couldn't believe my ears. I swapped back to a standard set of Bugle Boys 6DJ8s and confirmed that I'd never be able to go back to an untreated tube again. I knew I had to do all my tubes. I was sold. WHAT CAN I SAY MAN? I AM FLOORED! 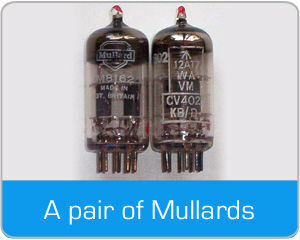 The improvements are immediate and very obvious compared to similar untreated Mullard CV4003. Your CryoMusic treated versions are hands down the winner; blacker backgrounds and deeper bass without loss of highs, in fact the frequency range appears to have extended. The detail is amazing even with ordinary untreated CD! Your treated CD (Audiophile Voices 3) I must say is a remarkable improvement compared to same untreated one! I would describe it as darker and blacker, more definition, lush and very detailed, there is also an immediacy and strong presence as if the vocalist is in front of me. 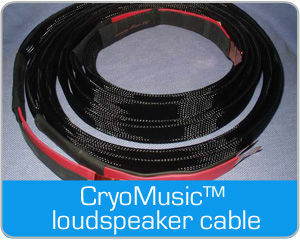 CryoMusicSystems has developed proprietary processes and custom equipment to optimise the treatment of CDs and as a result, found similar dramatic improvements in SACDs and DVDs. 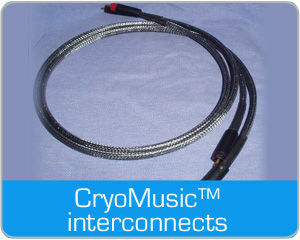 We deep dry cryogenically treat the disc to eliminate any optical defects created during the CD pressing process, allowing your playback system to extract maximum information from the disc. The background hash disappears giving a smooth clean presentation of the music. Voices and instruments are clearer and more clearly separated, more alive, more involving and more musical. Video quality in DVDs are also improved, with more and cleaner data being extracted from the disc after cryogenic treatment. CDs, SACDs and DVDs are moulded from polycarbonate polymer, a material known for its optical clarity. During the moulding process, the polymer is melted, stamped under high pressure and then cooled rapidly. This rapid change in temperature causes stress points in the material known as birefringence. Deep, Dry Cryogenic Treatment by CryoMusicSystems removes these birefringence defects by relieving the stress in the polycarbonate polymer, thereby eliminating optical errors from your disc and allowing your playback system to extract maximum information. No it cannot improve a bad recording. It only improves the quality of the data being processed by your player.